Exploring the uses and benefits of coconut oil for skin care from a personal perspective to help others. This article is about how I came to use coconut oil for a good part of my skin care. For most of my life I have used skincare from well known brands for my face and body. However a recent severe allergic reaction to several chemicals and ingredients commonly used in most skincare brands left me with a dilemma. I could no longer use most skincare that was available in the shops and stores so what was I going to do? This affected in particular moisturising my face, my body and shaving my legs. It took a lot of work and research but eventually I found that pure organic coconut oil could help me and be my happy solution! Here in this article I am only discussing the many uses of coconut oil as skin care not as a food. I would like to pass on what I found now to give other people a chance to see if it could be useful to them. Of course always consult your healthcare provider if you have any health issues. Have You Ever Used Coconut Oil? There are many coconut oil types on the market and some are better than others. As my skin is so sensitive I only go for the food grade organic oil. If you are using coconut oil go for the best you can afford. The ones I like most are the non-bleached, non-deodorised, non-hydrogenated, and not heat treated. The cold pressed oils and organic are much better. Coconut oils can come from various different regions so just choose what you think you will like most. I go for the less scented ones. Some of the oils have quite a distinct coconut scent and others rather less. I do love the smell of coconut oil but as my skin is so delicate I prefer to stay with the very delicate oils. You may choose to go with either depending on your skin and preferences. Essentially the less processed the better. I always choose organic and cold pressed that way you are getting more of the natural original coconut oil. I have extremely sensitive, allergic skin but I find I can use coconut oil with no problems and it really suits my skin. My dermatologist even said she thought it was a good idea to use coconut oil. Do You Have Sensitive or Allergic Skin? Yes but Only to certain ingredients I am aware of now. Coconut Oil and Body Moisturising. I love the way coconut oil makes my skin feel.... From being dry and parched and rough it is now silky smooth, soft, very soft and lovely to touch. I love using coconut oil on my skin. Having used it for many months now my skin is in very good condition, supple, conditioned and beautiful to touch. When you apply coconut oil you need to be a little careful, it is after all an oil. In most applications it will come as a solid block that very quickly tuns to oil as you warm it in your hands. At this point it can be somewhat slippery but my tip is to apply it and then do not get dressed for about 10 minutes. Just let it sink in then if there is still excess oil pat it do not rub it and then get dressed. I have not really found any issues with residue on clothing if i do this. Alternatively you can just apply it at night and get into your PJs and let it do its work overnight. You may notice a little coconut scent even on the low scented ones, which I love, but if you don't it dissipates quickly and leaves you silky smooth and nicely moisturised. 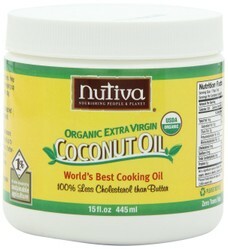 Most people use far too much coconut oil so do try just using a little, you can always add more as you need it. Makes for an inexpensive and very effective body moisturiser. Coconut Oil For The Hair! Coconut oil is also great for the hair. I have very fine hair that can quickly become oily so i tend to only use it about once a week as a special conditioning treatment. My husband has more coarse dry hair so he uses it every couple of days. Essentially you just take a tiny bit warm in your hands than smooth through the hair. If you can leave for several hours or overnight then wash out. leaves our hair shiny, conditioned and healthy looking! I would never have thought of shaving with coconut oil! Before my allergies I would generally wax but sadly i cant do that anymore as the wax contains ingredients I am allergic to. In addition due to my sensitivity, my husband cannot use shop bought shaving creams or oils either - well unless he stays well away from me ! So we both needed to look for something that we could use for shaving. My husband has a tough beard that grows very quickly so it had to be good. When we found coconut oil we thought to give it a go and you know it works beautifully! The oil really glides on and is just a clear transparent oil on the skin. A good razor is then required and the skin is amazingly soft afterwards. My husband gets the closest shave he ever has had! My over sensitive skin is just fine, my legs and underarms do not break out or go rashy or anything just smooth and well hydrated with the oil. In addition for some reason neither of us now get any nicks or cuts when shaving with coconut oil - which has to be a good thing! One word of caution if you use coconut oil in the bath it is lovely but it will make the bath very slippery ! So just be careful. Coconut oil is also a very inexpensive way of shaving! A little goes a long way. The photograph below shows my skin how it was during a nasty allergic reaction to ingredients often used in normal skincare products. My skin blistered and became painful, sore, intensely itchy and dry. It is a long story but suffice to say here that they eventually diagnosed me with severe allergies and resulting contact dermatitis to several ingredients including perfumes, balsam of peru, and Methylchloro isothiazolinone + methyl isothiazolinone. So I had to cease using all products that contained these ingredients and I soon discovered that most skincare, haircare and bodycare products do contain one or more of these ! I got prescription creams to use for a while but as my skin healed up eventually the medics wanted me off them and I had to have a long term solution for myself so that is how I found coconut oil! Please note I discussed this with the medics and so should you if you have a skin issue and want to try coconut oil. I do use some other products from specific providers that are not coconut oil but for all my body moisturising, shaving and general skincare I now use coconut oil. My skin that was not affected by the allergic reactions is now super silky soft and the skin that was affected is healing and softer and more supple. If you are concerned or interested in the effect that the ingredients Methylchloro isothiazolinone + methyl isothiazolinone can have and the growing numbers of people allergic to them do read this article. Why I don't use "normal" skincare creams! This is the result of my allergic reaction to the ingredients.I am allergic to perfumes, balsam of peru, and Methylchloro isothiazolinone + methyl isothiazolinon found in many skin care lines. Website about caring for sensitive and allergic skin. Always Do A Skin Patch test. It is very important when trying any new product to do a test patch area for several days even up to a week or more to see if you are sensitive to it. Only do this with leave on products like moisturisers not with shampoo etc as that is not designed to be left on the skin. People can be allergic or sensitive to anything. This is how you can do very basic patch testing at home. Only test ONE product at a time. First dab a little on a very small area and immediately wash it off. If you are getting any reaction then do not continue to try further patch testing or use the product. If you have had NO reaction then try for 10 minutes and increase for several hours. If still no reaction then you may be fine. If in any doubt consult your healthcare provider. Please do bear in mind that anyone can become reactive to anything at anytime. Do be aware of any reactions to any skincare you are using ie itchiness, rash, tiny or large blisters, redness, soreness and /or swelling. If this occurs stop using the product and consult your healthcare professional as a matter of urgency. I am recovering from severe skin allergies -contact dermatitis- and not a medical expert.This article contains personal opinions that are not intended as medical advice. The contents are not intended to diagnose, treat or give a medical opinion. The information here is no substitute for medical diagnosis and guidance. Consult a physician in all matters relating to health, particularly concerning any symptoms that may require diagnosis or medical attention. Never disregard medical advice, or delay or change treatment because of something you have read here. For assistance with skin conditions, or any other medical condition, always consult a qualified healthcare professional. Your health is your responsibility. Thank you For Reading - I Welcome Your Comments. I Love Coconut Oil. What Do You Think About Coconut Oil? Thank you for all of these uses...I know Coconut Oil is popular, but I haven't started to use it yet. I think it would be a good idea for me to try it soon, for skin and hair as well. I never thought about coconut oil for the skin - I use it in baking now instead of butter, but I guess that's a different kind of oil. Thank you for your kind words nightbear. I am glad that you found coconut oil helped you too. Yes you are right there is a slight scent but it goes away so for people who can wear perfumes etc it doesn't seem to clash. For me - unable to wear perfume - it just makes me feel fresh and clean smelling :) . I do use coconut oil ever since as a child. Really good for the hair. I have used coconut oil and cream before. After a severe sunburn and it was very soothing and kept me from peeling. I like the slight scent it has when first applied but it doesn't linger so I could go ahead and use my after bath spray. I am glad you found something you could use after this awful allergic reaction. Good for you for your persistence in the search. Thankyou Mira. See what you think. The one I use is not really scented at all, it just has a pleasant very slight aroma when you put it on but I am not aware of smelling strongly of coconuts! As i am allergic to perfumes but not coconuts it is practically the only scent I can have anyway. I do know it varies between brands and the origin of the coconuts. Some are stronger scented it all depends what you like really. It is an oil which took a bit of getting used to -and you do not need much- but once it sinks in it just leaves my skin feeling lovely. Thank you for your lovely comment. Yes I am so happy I discovered coconut oil. I feel so much more content about what I am putting on my very sensitive skin. I am glad it works well for you too.